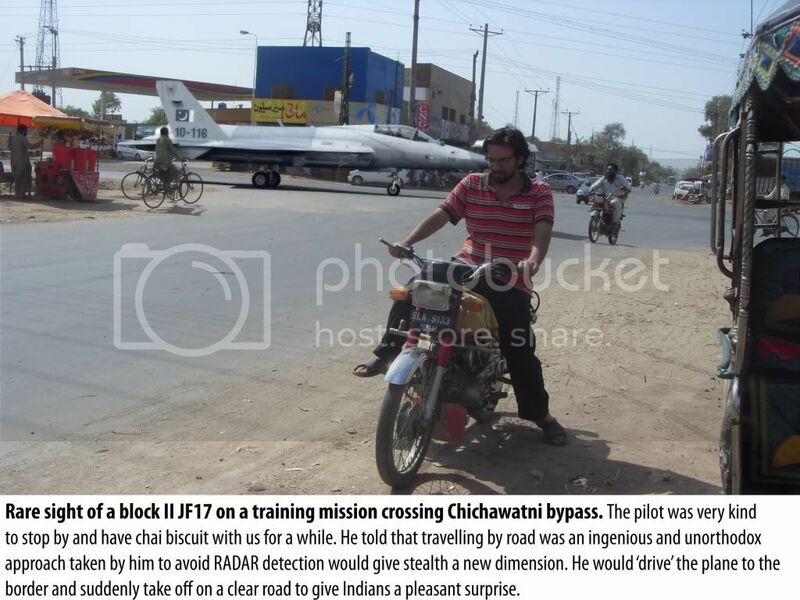 Military Photos and Photoshops: ' Jf-17 on Chichawatni Bypass ' gets featured .
' Jf-17 on Chichawatni Bypass ' gets featured . Well, well, this one pic seems to making quite a buzz at social networking sites. It came to my notice quite unexpectedly. Actually, i took this pic almost a year before and the guy on the bike in front is my younger brother. Someone shared it on Media Mug International s Facebook page, Here , with 674 likes, 357 shares and 174 comments. Though most of them are just plain stupid. Anyways, then it got shared on various other pages and finally made it to an Islamabad University Alumni page, of which my bro is a member. His friends recognized him and called to ask if he was really him. haahahaha. Now i guess i understand how ppl feel when they become a celeb overnight. well, almost..... u dont have to eat a bucket load of salt to know what it tastes like or do you ?